Since 1999, Harbor Touch (formerly United Bank Card, Inc.) has provided merchant services, payment processing, and point of sale systems to thousands of customers across the nation. Lighthouse, the parent company of Harbortouch, purchased Shift4 Payments in January 2018, which brings a new chapter to Harbortouch products and services. Lighthouse will now be branded as Shift4 with an aim to empower the over 300 existing Shift4 software integrations with game-changing benefits for current and future customers of Harbortouch’s POS systems and merchant services. Harbortouch provides a full range of products for every business type with products like POS systems, credit card payment processing, Casio cash registers, and EMV credit card terminals. Having a great product doesn’t mean anything without exceptional support. Our award-winning customer service and support is available 24/7 and is based in-house in the USA. Also, each Elite POS order includes menu programming, free onsite installation, and professional training. These services alone can save merchants thousands in upfront costs over other systems. 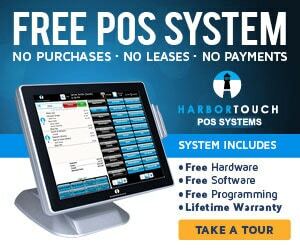 With many years of experience in the point of sale system business; Harbortouchs’ fresh and innovative approach to providing free touchscreen terminals, credit card machines, and cash registers have garnered accolades from customers and has received many awards from industry organizations. Harbortouch proudly supports the entire USA and there are Harbortouch distributors, resellers, and technicians all over the country ready to assist you. Rest assured you’ll get the best service and support from a top merchant provider that truly appreciates their customers and wants to help them be successful.